With customer service top of mind, Mulder’s Landscape Supplies offers delivery services. Feel free to learn more below or contact Mulder’s for details. Mulder’s offers delivery service around our location. There is a minimum of 1 cubic yard per delivery. For reference, 1 cubic yard is equivalent to a 3 x 3 x 3’ object, such as a kitchen stove. Our trucks can carry up to 35 yards of some products. 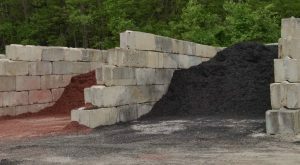 Call today to schedule your delivery of landscape supplies, bricks and blocks, nursery items, and more. An effective and cost efficient product used for removing snow and ice from walkways, driveways, and parking lots, our rock salt is optimally sized for maximum performance and free flowing action. Smaller crystals melt on contact while large crystals provide longevity and instant traction. This helps prevent snow and ice from bonding to walkway surfaces or becoming hard packed. Rock salt is effective at temperatures as low as 15º F. We carry 50-pound bags. Extreme Melt is a natural mineral blend of sodium, magnesium, calcium, and potassium that dissolves quickly to penetrate through frozen surfaces. Our deicer is finer than ordinary rock salt and ideal for use in walkway or hand spreaders where product control and placement is essential. Extreme melt is effective at temperatures as low as 5º F. We carry 50-pound bags. Mulder’s also offers bulk road salt. Pre-approval is required. Contact us to request this item. We also carry a liquid solution for de-icing made from calcium chloride. Being a liquid allows for easy storage and the solution is an alternative to expensive sidewalk de-icers. 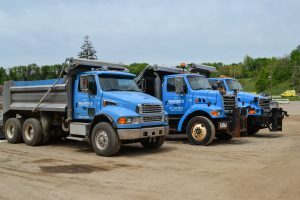 Mulder’s Landscape Supplies offers front-end loader and snow hauling services during the winter months. Please contact us for more information and pricing. No matter what season it is, our friendly and knowledgeable staff is available to help you plan your next landscaping project. Be sure to contact us to verify seasonal hours! 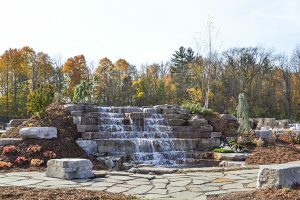 True to our name, Mulder’s Landscape Supplies carries a wide variety of landscape supplies to meet the needs of professional and residential customers alike. From mulch to timbers, we’ve got you covered.